The team at Chartis Research is about as well regarded in financial services as you get. Their flagship report on the RiskTech100 is the bible for the industry and their ability to go deep on the issues AND the technology set them apart. They have recognized Ayasdi consistently. We won their top spot in for AI in 2016 and 2017 and took the runner-up slot in 2018 (a three-peat would have been unprecedented). The team over there continues to dial it up – and the 2019 Artificial Intelligence in Financial Services Market and Vendor Landscape is a superb example. Over 24 pages, they detail the best in Data Management, Workflow and Automation, Analytics and Packaged Applications. We were delighted to make two of those quadrants. In Analytics we were one of just three companies in the Category Leader segment. This represents a tremendous achievement as we outperformed dozens of companies that are hundreds of times larger than us. We also made the Packaged Applications quadrant as a Best of Breed company, just barely missing scoring another Category Leader slot. While we just missed this year we expect our growing portfolio of applications to move us up and to the right in 2020. That suite, enabled by our ever advancing Envision application development framework, will allow us to combine domain expertise with a library of UI widgets and machine learning recipes (segmentation + prediction, anomaly detection, hotspot detection, topological predict) across dozens of use cases. The force multiplier comes in the form of our partners and our customers. Envision is so simple that domain experts can turn the crank on applications, without having to lean on IT. This is significant for partners like Navigant, Parker Fitzgerald, Crowe and Accenture. This is something to watch in the coming year. To read the full report requires a Chartis subscription – but its worth it. 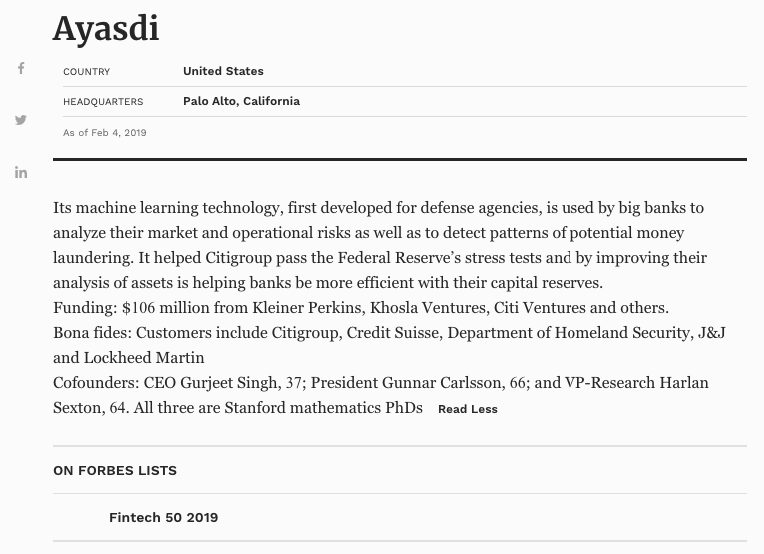 The next big win for Ayasdi came courtesy of the team at Forbes. Each year they publish a list of the top 50 fintechs in the world. It is an exceptionally competitive list. There are literally thousands of companies in the fintech space from the giants like Stripe, Ripple and SoFi to emerging stars like Enigma. Filtering through the PR pitches and marketing noise to find who actually has traction is a tall task, and Antione Gara and his crew have done an excellent job. The team keyed in on our success in financial crime. This is an area where our technology has changed the equation, allowing for gains in efficiency and effectiveness while leaving the existing infrastructure untouched. We make everything else better. This has been a HUGE month for us on the recognition front. From the Accenture HealthTech Challenge win to this amazing double it represents tremendous validation for the team and the technology.